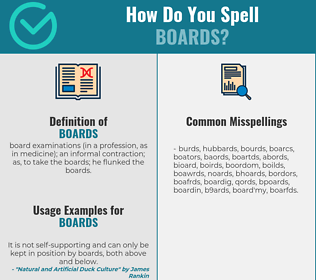 How Do You Spell BOARDS? Correct spelling for the English word "boards" is [b_ˈɔː_d_z], [bˈɔːdz], [bˈɔːdz]] (IPA phonetic alphabet). Below is the list of 206 misspellings for the word "boards". board examinations (in a profession, as in medicine); an informal contraction; as, to take the boards; he flunked the boards.